Hans Hecker was an engineer who worked on livestock equipment, and bicycles before venturing out on his own to produce motorcycle components in 1922. The Nuremburg company essentially sold kits under the name Emora, which were everything except the engine and transmission. As a natural progression, they soon began to make complete motorcycles, the H1 and H2. Like many others, they started out with engines from others. S&G was the first engine supplier, but when that firm started to produce their own motorcycles, Hecker was forced to look elsewhere. As a producer of small bore machines, they turned to the British firm JAP, and Swiss firm MAG. Once under way, it did not take long for Hecker to begin producing larger and more well-equipped machines. Machines of 198cc 548cc, and 746cc found their way into new models in 1927 and 1928. They also went racing to support sales with success in mountain races, reliability trials, and a victory in the German Grand Prix at the Nurburgring in 1929 with englishman Syd Crabtree riding. Continuing with their success in the small bore category, they used Sachs engines for 73cc and 98cc machines going into the 1930s. Motorcycle production paused as World War II approached, and Hans Hecker died in 1942. however, his sons gathered equipment and machines which remained after the war, and Hecker reemerged in 1948. The company concentrated on smaller machines with engine sizes ranging from 98cc to 250cc. Engines were supplied by ILO, Sachs, and Villiers. 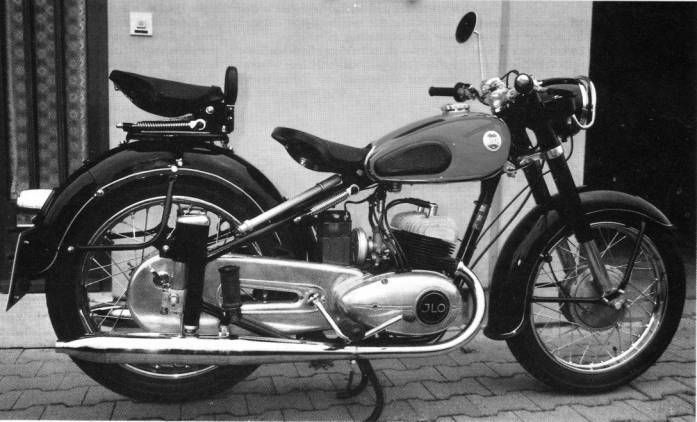 Most popular was the K125 which persisted from 1948 to 1954. The K125 was joined by 200cc and 250cc machines in the 1950s. However, the smaller end of the spectrum was always the strength of Hecker, and they introduced the G50R moped in 1954, and a "sports" version soon after. Hecker continued to rack up victories in reliability trials, but the rise of automobiles, strong competition, and the economic downturn, were too much to absorb. They closed the doors in 1956.